We as humans have to brush our teeth because of the daily accumulation of plaque in our mouths. It’s exactly the same for our cats and dogs. Plaque is the sticky white material that forms on our teeth and is made up of food particles mixed with saliva and bacteria found in the mouth. If we don’t remove it plaque and it’s bacteria build up (particularly on the gumline). Over time the gathered plaque calcifies to form tartar which is much harder to remove. The presence of loads of bacteria in plaque causes inflammation of the gum (gingivitis) and subsequently damage to the tooth attachment (periodontitis). Neither of these are good news for mouths and can require treatment at the vet. If left untreated gingivitis, periodontitis and the accumulation of bacteria around the tooth can cause your pet to suffer – these problems can cause pain and bleeding in the mouth and infection that can even spread via the bloodstream to other areas of the body. Why do I need to stage it? In medicine (veterinary and human) us professionals like to use a standard system to score how bad things are. It means when it comes to treatment, we can tailor our advice to how bad the issue is for your particular pet. There’s a nice system in place for vets to score dental disease in our pets and I want to share it with you because the stage of your pet’s dental disease directly affects what treatment your vet is likely to recommend to you. Having a better understanding of the severity of your pet’s issue can help you feel more able to make decisions about what treatment is best for them. The gum – also called the gingiva, hence why inflammation (or red) gums are termed gingivitis. Tartar, established gingivitis and periodontitis – damage to the attachment of the tooth. This can be invisible in the conscious pet and is why it’s important to have animal teeth checked under anaesthetic by a vet: it’s only found using dental x-rays or testing the attachment with an instrument called a probe. Major dental disease – severe tartar, obvious gingivitis with dark red, sore or bleeding gums and significant periodontitis. However sometimes the gumline can’t be seen because the tartar build up is too bad. So there you have it a simple scale that helps you to understand what your vet might find. 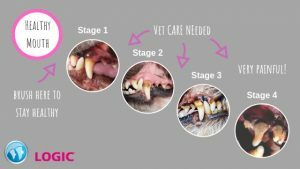 Here’s what sort of treatment to expect at every stage, remember though different teeth can be at different stages even in the same animal so your pet might be a mix of two categories. Your pet will need a dental deep clean but may also need some teeth removed – any teeth with damage to the periodontium (tooth attachment) will need to come out as this damage is irreversible. Your pet will need a dental deep clean and removal of many teeth is likely. Significant pain and bacterial infection will be present before treatment so your pet will be very relieved to have this resolved for them!